Northwest Community Hospital ER check-in and waiting area. The busiest Emergency Room in the northwest suburbs is getting bigger, more advanced and more comfortable. Northwest Community Hospital in Arlington Heights opens its new state-of-the-art Level II trauma center Wednesday, Aug. 17, marking the end of a multi-phased renovation and expansion project over four years. NCH’s new ER is designed to accommodate 90,000 patients per year in a family-centered environment that features a full spectrum of the latest technologies. In 2010, the hospital treated 74,300 emergency patients. Privacy and safety were critical factors in the design of the new treatment rooms, now separated by walls and sliding glass doors instead of curtains. Nurse call lights in each room allow for an immediate response from clinical staff, and psychiatric liaisons are now located in the ER to provide better support to patients and families. 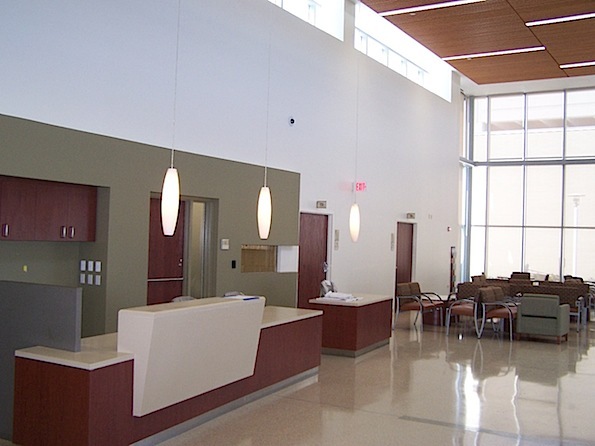 There are specialty rooms for trauma, critical care, isolation and behavioral health. A decontamination room ensures that NCH is prepared for large-scale emergencies. A spacious family waiting area is unlike a typical ER setting, boasting high ceilings and natural light. An adjacent outdoor garden area gives family members a place to step away for some fresh air. The multi-year project that began in 2007 enlarged the ER from 23,000 square feet to 36,000 square feet. A total of 56 beds are equipped to treat a wide range of emergency injuries and illnesses. The adult ER consists of eight triage beds and 37 treatment rooms, while a new Pediatric ER has three child-friendly triage beds and eight treatment rooms. The Pediatric ER, which opened in May 2010 with the hospital’s nine-story South Pavilion addition, is separated from the adult ER to provide a gentler environment. It’s staffed by Children’s Memorial Hospital pediatric emergency specialists who bring world-class care close to home. Doctors and nurses use child-sized equipment and follow guidelines for weight-appropriate medications, all in a kid-friendly atmosphere. To learn more about the high-quality emergency services at NCH, visit nch.org/emergency.